Many people in the West would like to see democracy bloom in the Middle East, and the Arab Spring movements there that the West supported reveal that many individuals aspire to democracy, or at least the moral and economic independence they see in the West. However, if the Arab Spring taught the world one lesson, it was that giving a democratic vote to people unprepared for democracy is likely to make conditions worse than the dictatorship they experienced before a democratic revolution. Democratic evolution, as opposed to revolution, might be a more possible path to democracy, as evidenced by the developments in Tunisia that preceded the revolutionary Arab Spring fervor that resulted in disaster. 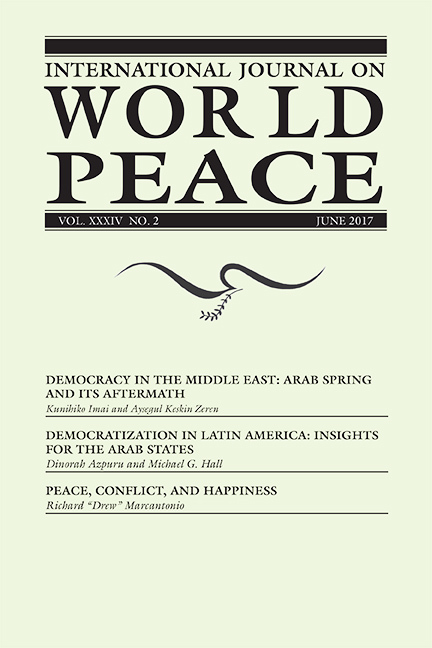 This issue of IJWP contains two articles that examine this question. Imai and Zeren argue that there is no inherent reason that Islam is incompatible with democracy. Because “democracy” is such an ill-defined term, they chose to measure democracy with indexes of freedom. They noted a significant distinction between “electoral democracy,” the right to vote at the ballot box, and “liberal democracy,” or political freedom. They note that the Arab world has remained significantly behind in terms of electoral democracy, but not in terms of liberal democracy. Islam was positively correlated with liberal democracy, while oil was most highly correlated with the elite’s ability to hamper the development of electoral democracy. Imai and Zeren also argue, against critics of modernization theory, that modernization in the Middle East does correlate with the rise of liberal democracy, even though it does not correlate with electoral democracy. Happiness is strongly correlated with “GDP per capita, social support, healthy life expectancy, freedom to make life choices, generosity, and freedom from corruption,” and a requisite of quality peace. Marcantonio finds that “quality peace” is not strongly related to some traditional factors like the absence of war or conflict, and may not be best analyzed at the state level. He suggests much more research in peace studies could be conducted along the lines of quality peace, or what leads to human happiness. 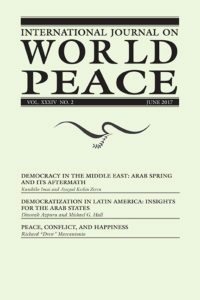 This brings us back to the original question as to whether ending war, resolving conflict, or promoting democracy should be the main concern of peace studies, or whether these may simply be a means of moving a level above oppressive dictatorships but still far from achieving human happiness. The U.S. Founders considered their constitutional and representative government, which curtailed the excesses of democracy, as being in the interest of citizens’ happiness. If the concept of quality peace is further pursued, it may one day be discovered that politics, like war, is opposed to peace. If politics is the art of fighting over resources by other means than war, then politics might be a symptom of a society in which the best principles of governance for attaining quality peace are unknown, or do not exist. Where governance systems are functioning to provide the highest quality peace, like a well-tuned automobile, no change is necessary and therefore democratic politics might only harm things. It would be good to develop a notion of “positive politics,” which would mean that a political party would only exist to improve the welfare of the whole, rather than to fight for resources for its constituents.